My friend Lauren works about 10 very scenic miles south of Cambridge, and after she and I ate too many ginger biscuits, we decided that she and I would get up before dawn and cycle from Cambridge to work. She would go to her desk and I would turn around and go home. Because that’s what I do for fun. Naturally, we chose the coldest day of winter so far; temperatures hovered around freezing the whole time. Also, I got a little lost on the way home. Despite the pre-dawn departure and a persistent, biting wind, it felt like a grand adventure. I was really amazed – again – by the extent of the cycling infrastructure in this country. Cars may not defer to you when you’re in the street, but there is an extensive network of off-road paths, with bridges and signage to match. I went 22.6 miles round-trip (plus another ten in the course of my everyday errands), and today I can feel it in my bum a little. Is that a purpose-built concave ramp for cycling up stairs? No, its not designed to be bicycled on. 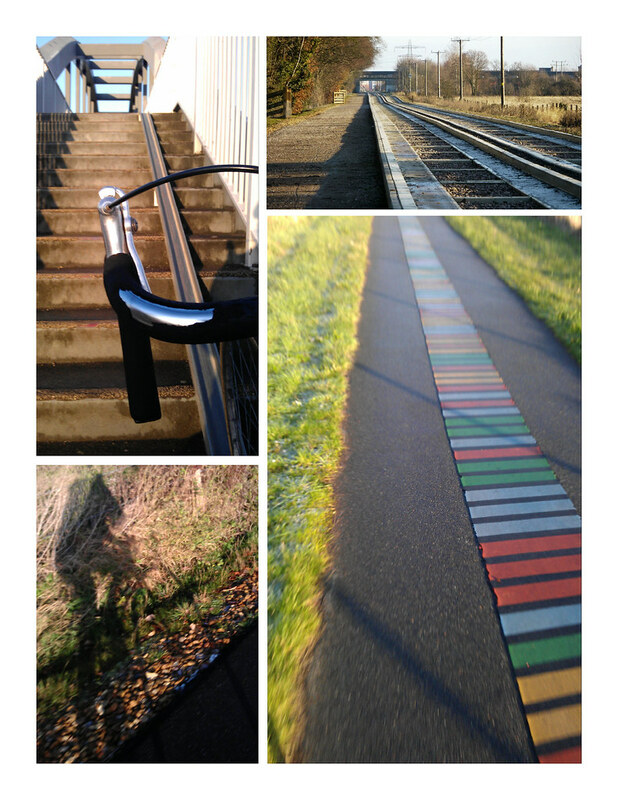 You get off your bike, put your bike in the little track, and then you can push it up the stairs rather than carry it. The steps are too steep for cycling up, but a lot of people here ride really clunky old bikes and also are older themselves, so having an option not to carry their bike up steps makes a big difference. The other amazing thing about this bridge in particular is that the farmer who owns the right-of-way on either side of the bridge won’t allow it to be paved – so that there is a purpose-built ped and cycling bridge in the middle of fields. That would NEVER happen in the US – but here, there are purpose-built cycle-ped bridges all over, including in the middle of farms.